Completing the 10 day Raid Pyreneen on our tandem was one of the greatest experiences of our life. VeloLoco was terrific at helping us find a wide range of accomodations, while we focused on the riding. We enjoyed everywhere we stayed - all were clean and helpful, and each was prepared for storing our bicycle - no easy feat with a tandem in Europe. VeloLoco's familiarity with the route also helped us make some better decisions regarding our schedule than we would have made otherwise, and clued us in to potential stops we didn't know about at all. The price was very reasonable, and knowing that VeloLoco was available for immediate consultation on our "unsupported" trip in an emergency was a real load off our minds. VeloLoco's assistance helped us plan an amazing trip, allowing it to go without a flaw. Thanks Dave for being our professional yet laid-back guide on our unforgettable Pyrenees crossing. With your organisation and support we were able put all our focus into enjoying the challenge of the daily ride, knowing that we had a clean and comfy hotel arranged and a good evening feed ahead of us. 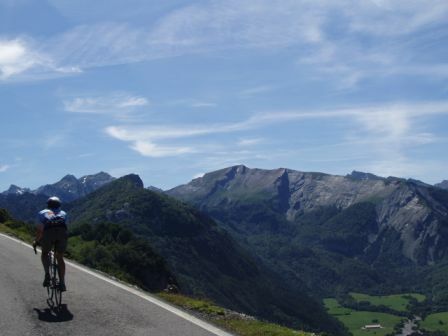 We particularly appreciated the flexibility in route choices some days so that those over energised members of our group (of Scottish descent) could be exhausted on 5 cols while we could be equally satisfied with 3 big cols for the same day. We enjoyed your company on some of the climbs and yet you were always there when needed to perk us up with fruit, nuts, water and those UK energy bars were a lifesaver! Back home in Oz now my friends have noted that I have been transformed into a hill loving, long distance cyclist inspired by the antics of our international group members in the Pyrenees raid. Many thanks for making it all happen. Veloloco helped me realise my dream of completing a RAID Pyrenees. The scenery was breathtaking and the route was well planned and run professionally. Thank you David and Sam for your great hospitality and the experience of a lifetime that I will never forget. You made organising the ride very easy - both with an outline itinerary which we enjoyed filling in the details of and good quality and value hotels. Day 4 (Arreau - Aulus-les-Bains) was expected to be about 143km, but ended up being 166km and took 10.5 hours riding time with all the passes and about 14 hours overall. In fact we never finished until 11pm that day. It made for even more excitement and more to talk about! We went to Spain with our group of friends with the tour operator they chose. I have to say your ears must have been buzzing during that time. Unfortunately the operator in Spain was probably from the Franco era !! very dogmatic and rigid. If i don't see another buffet as long as i live i will be truly happy. Fortunately we had arrived 5 days before the group and had a chance to truly experience the Mediterranean life. We had such a great time crossing the Pyrenees with you and often talk about it. David is an exceptional organiser and very likeable guy. 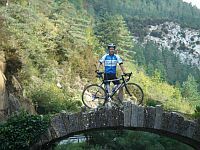 Being a keen cyclist himself he understands the demands of riding day in and day out, and is ever conscious of ensuring we were well fed and rehydrated, both throughout the day and after hours. Being a local David also knows the best places to stay and eat, which was a real treat for us. I highly recommend David and Veloloco to anyone considering a cycling holiday in France, whether it's high intensity 180kms per day or a more relaxed riding tour. We have been enjoying looking over the holiday photos, it really was a great holiday and quite an experience. I was wondering if you had graphically charted the rest of the trip yet. I would be really interested to see the whole route mapped out, like the few days you showed us on your laptop. Might that be possible? YES! Profile is here. I touched down in Sydney on Saturday evening after a relaxing week in St Emilion / Arreau. Just wanted to thank you for organising the trip, as I think we all got the most out of what the Pyrenees have to offer - pain, more pain, sights and great food! I look forward seeing you again in the not too distant future. We all got home safely last night arriving into Elgin at about 11.30pm. We await the arrival of our hold luggage that got left at Gatwick after our very rushed transfer off the late Toulouse flight. The smutty jokes and inuendo continued right up until we arrived home but by now we will all have been reconverted to fine upstanding teatotal members of society! Once again many thanks for organising a quite superb cycling experience. Trust that the rest of your summer goes well. I heartily endorse Mark's sentiments about the holiday and thank you once again for all your support which I really did appreciate.